Enjoy this guest post from Erika Goldwater, Director of Marketing, Marketing Automation Institute. Marketing Automation (MA) can help an organization achieve a lot of great things. In fact, I have heard people say MA solutions can do everything except make toast. One of the most significant ways in which MA helps an organization is driving more revenue. After all, at the end of the day, revenue is what matters. Marketing automation has a lot of other benefits that are related to increased revenue when used properly (like any powerful tool — it must be used properly). But the most strategic and significant reason is revenue. Take a look at a recent Sirius Decision graphic on the ROI with and without MA. Pretty compelling. 1. Predictable revenue — this is a biggie, perhaps the most significant reason to use a marketing automation solution. All organizations needs to make money and being able to predict revenue and having confidence in those predictions enables organizations to execute operations efficiently. This is hugely important to public companies that must provide projections to Wall Street, but just as important to smaller businesses so they can make informed decisions about adjusting spend or other strategic maneuvers. 2. Higher average deal size — another great advantage of using a MA platform. Obviously, the higher the average deal size, the better. Using a MA platform helps nurture a buyer, showing significant value of the “product” through various stages of the sales funnel. The higher the perceived value of a “product” the less a purchasing decision is based on cost and as a result, average deal size is generally higher. 3. Sales efficiency — is a result of the automated, lead scoring and nurturing capabilities of marketing automation platforms. The advantages of having a clearly defined lead scoring process (jointly developed and agreed upon by sales and marketing of course) enables definitive action for sales. Once a lead reaches a certain stage — there is no gray area as to who owns what. Another way that sales becomes more efficient when lead nurturing is in place. This allows sales to focus only on the opportunities that are ready for attention and have exhibited the pre-determined buying signals. Sales people close deals — that is what they are paid for. An effective nurturing program enables sales to focus on closing deals as opposed to pushing prospective buyers through the funnel. Without a doubt, strategic planning and clearly defined business processes must be in place for any marketing automation solution to be effective. However, when implemented properly, get ready to reap the benefits of MA and drive more revenue. 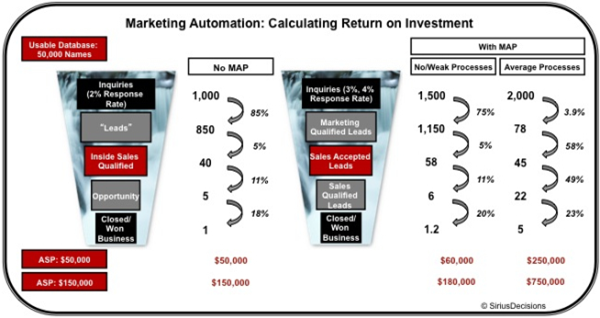 Great description of Marketing Automation Services. Its really helps a company to improve their revenue and in growth of business. Great post . I have used infusionsoft and also ontraport and they are both really great to improve Marketing automation. I have also downloaded your case study. Great post! Marketing automation definitely makes the lives of new generation marketers much easier.